Installation Is A Snap. Here’s What You Need To Know. There have been so many finned tube element manufacturers over the last seven decades it’s likely you have no idea which company made your baseboard heaters. The majority of these firms are long gone – along with the possibility of getting replacements for parts that went missing or need replacing. 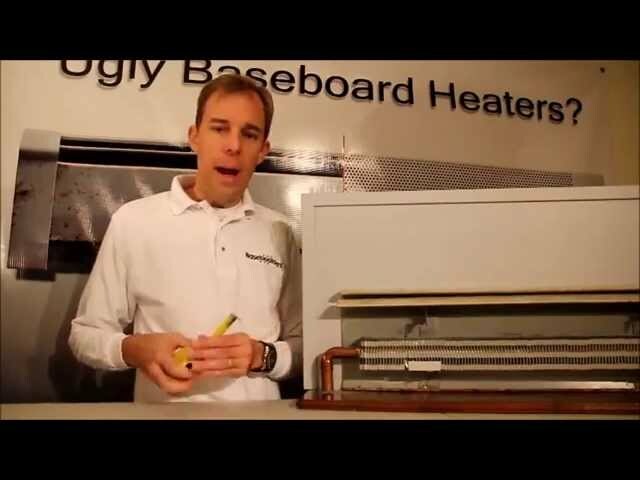 To solve this problem, Baseboarders® use a simple one piece, one-size-fits-most design that complies geometrically to about 95% of all hydronic (hot water type) baseboard heaters ever made. The overall objective of the Retrofitting Guide is to confirm that the existing finned tube element will be completely covered. The guide is applicable to all product series except Premium TALL (see the notes below to know when this taller version is necessary). Remove one endcap and the front panel. Measure between the finished floor and the top of the baseboard heater. Measure between the bottom of the heating element and the top of the baseboard heater. Objective: Between 5″ and 6-3/4″. If this measurement is less than 5″ it is likely the floor to top height is less than 7-1/2″ as noted in step #2. In this case, the WB001 wall brackets should be used to bring the mounting height up for proper coverage. If the distance is greater than 6-3/4″, the BB003 Premium TALL profile should be used. Measure between the outside face of the finned tube heating element and the back plate. It is very uncommon to fail this final check. If the larger 4″ x 4″ or 4″ x 6″ commercial style element is in place, a picture-framing in a wood molding as shown here will solve the depth issue. Ready to pick your style, panels, and accessories? Sometimes the back plate is not available to be used for a quick and easy slip-on installation. It might be a new construction environment or a totally gutted renovation. As with every possible scenario, we have a simple solution using easy-to-install wall brackets. The back plate, by the way, is that chintzy piece of metal that was secured to your wall without any thought on how it might be removed one day when it rusted. Back plates installed prior to the 1990’s are probably nailed in place, but even if screws were used, it’s still not an easy job as the finned tube element is normally positioned in a way that makes accessing the screw heads nearly impossible. It’s a tricky job, but our friends at Ask This Old House made it look easy when they did a great piece on how to remove the back plate. To make the job easy, locate and drill a pilot hole 7″ above the finished floor. This is only a recommended height. Ultimately you can decide how high to mount the Baseboarders® panel. Using the screws provided, secure one WB001 wall bracket at each end of the heater. Use a third in the middle for additional support and for 6′ and 7′ lengths. The wall bracket will produce a thin gap between itself and the wall. This gap will receive the lip on the back side of the Baseboarders® panel as illustrated.